We thought the drama between Nollywood actress, Lilian Esoro and her baby daddy, Ubi Franklin may be over but we are far from it yet. 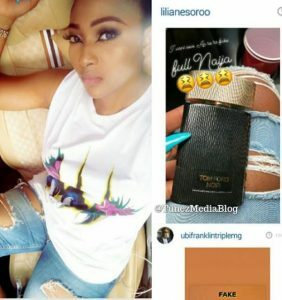 The beautiful actress, took to her IG to share new newly purchased perfume but her baby daady, quickly called her out, saying that the perfume is fake and also, went ahead to lecture people on how to recognise fake and original. Some of her fans feel, Ubi may still be in-love with Lilian.